Corniche Ultra Lounge draws inspiration from the routes des corniches, cliff roads overlooking the French Riviera. 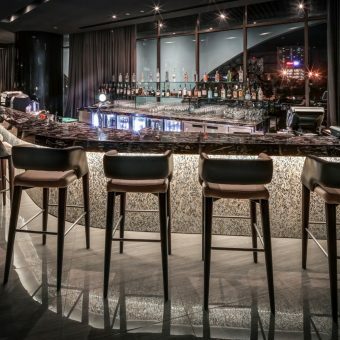 The bar is a vibrant after-work space on the 1st floor – a place for encounters over signature cocktails, champagnes and international wines, courtesy of Vinoteca by Pullman. Corniche brings a surprising twist to tapas by serving savoury small bites from not only Spain, but also Italy (cicchetti), Greece (meze), Vietnam, China (dim sum) and Japan (yakitori).